You have received that important message some time ago over WhatsApp and now you need to find them again, then you may need search for them. Although it can be a pretty simple task for many individuals, some users still wonder how to search WhatsApp messages on iPhone with other simple ways. For the benefit of novice users, this article explains how to search WhatsApp messages on iPhone with ease. 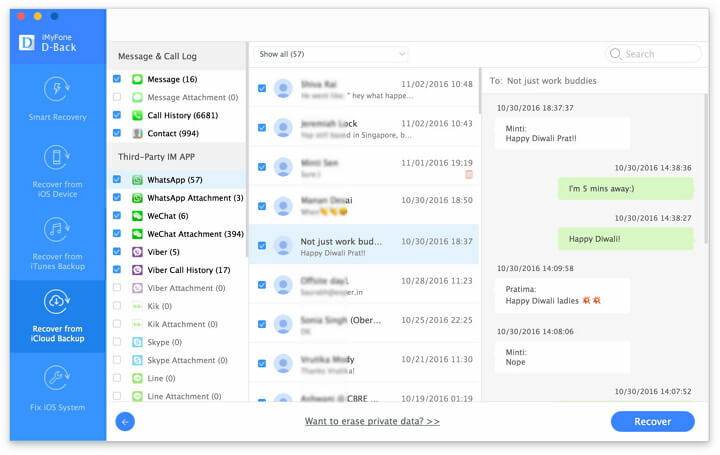 There are two methods for you to consider when it comes to searching WhatsApp messages. From this point onwards, we are going to explain those methods so you can choose the best option that matches your requirement. As mentioned above, we present you two options to consider: the professional one and traditional one to search WhatsApp messages from iPhone. Before we learn how to perform those two methods, let’s have a quick insight about the pros and cons of both options. With iMyFone D-Back, searching for deleted WhatsApp messages on your iPhone is a walk in the park. 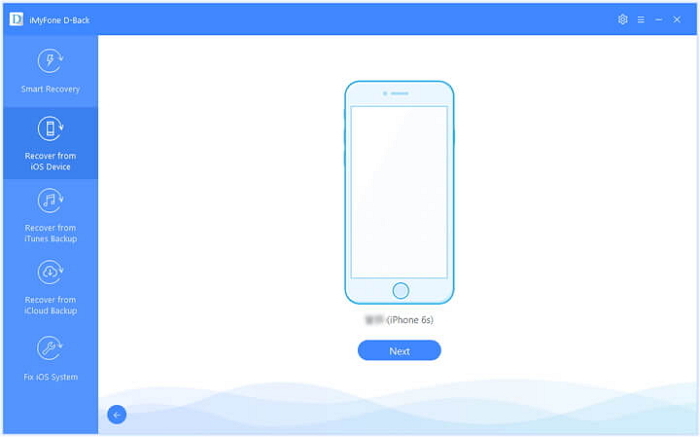 It lets you recover deleted files without affecting the existing backups of the phone. 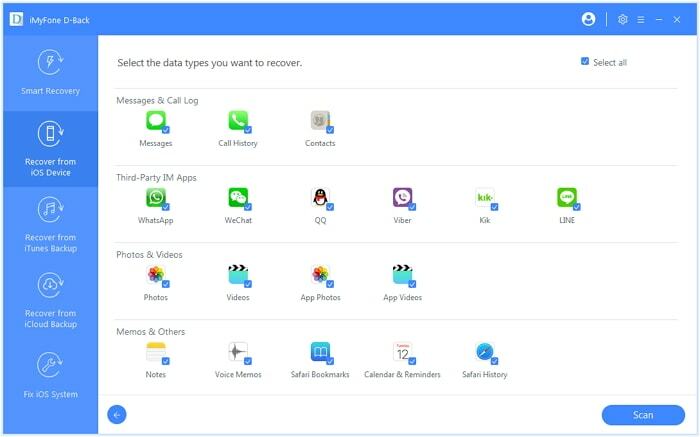 iMyFone D-Back is an excellent software that comes with a range of features to search data from iOS devices, including the deleted and existing ones. This tool utilizes a smart algorithm to assure an excellent success rate in searching deleted data. It can search both deleted and existing WhatsApp messages from iPhone. It can search WhatsApp messages from iPhone backups like iTunes and iCloud. It can search and export WhatsApp messages selectively or fully. Here’s how you can search for deleted or existing WhatsApp messages on your iPhone. Step 1.Open D-Back on your computer and click on “Start” found under “Recover from iOS Device”. Connect your iOS device to the computer and click Next. Step 2.Specify the WhatsApp data type you intend to search and click on “Scan”. Step 3.Wait for the scanning process to be completed and see the recoverable files. You can either click on “Show only the deleted files” or check all the files and click on the option “Recover”. You can search your WhatsApp messages on iTunes backups as well. To do that, you can follow the steps mentioned below. Step 1. Launch D-Back and go to “Recover from iTunes Backup” > “Start”. Select the iTunes backup where your WhatsApp messages are and click “Next”. Step 2. Click on the files you need to recover and hit “Scan” button. Step 3. You can either select “Only show the deleted files” or browse through the files. Hit “Recover” and define a folder path so your files will be saved to the folder. Now, let’s see how to search WhatsApp messages from iCloud backup using iMyFone D-Back. Step 1. Launch the program and go to “Start” menu under “Recover from iCloud Backup”. Provide the credentials of your iCloud account. Step 2. D-Back will search for all the available backups. Select the backup that contains the data you are looking for. Click “Next”. Step 3. Click on “Scan” after selecting the files you expect to recover. Once the results are displayed, preview the files and choose the exact files. Then, hit “Recover”. As of today, iMyFone D-Back is becoming a norm in the area of iPhone data recovery. This software shows a lot of character to recover data effectively and it is already trusted by a large number of users globally, as well as professional websites. 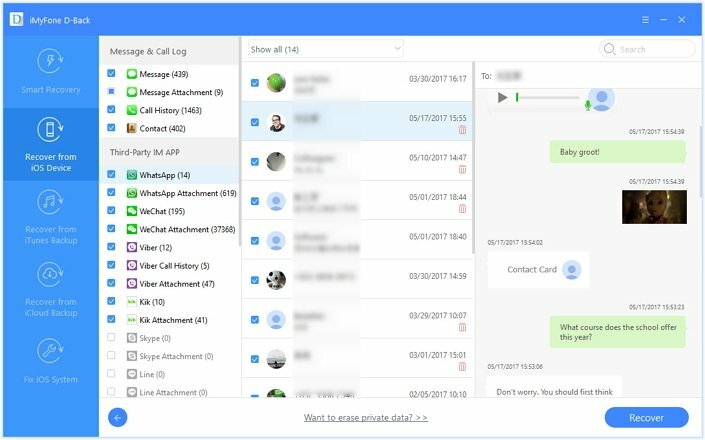 Now, let’s take a look at the second option: the traditional method you can use to search and recover WhatsApp messages. 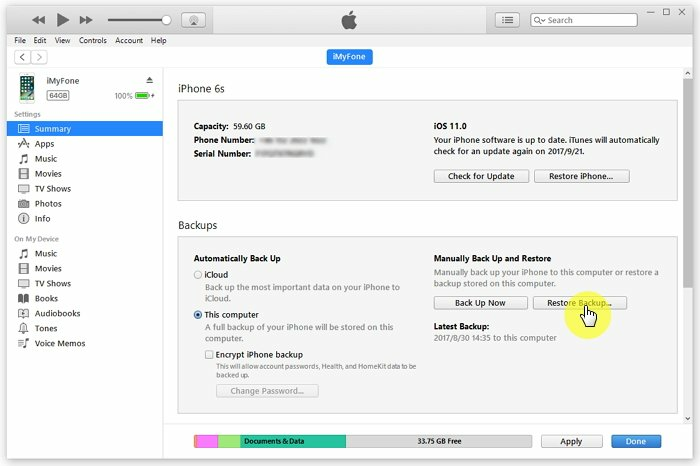 In this method, we will use the iTunes and iCloud backups. First, let’s see the possibility of searching WhatsApp messages through iTunes restore. Step 1. Launch iTunes on your computer and connect the device into the same computer. Step 2. Select the option “Restore Backup in iTunes”. Step 3. Identify the most relevant type of backup by determining the date and the size of the backup. Click on “Restore”. Step 4. Be sure that the device is connected until the process is completed. Step 5. Once the synchronization is finished, use the phone. Can’t view all the content of a backup which may cause you to choose the incorrect one to restore. You cannot search and recover data selectively which means you have to restore everything and scour through the data until you find exactly what you want. Once you complete a full restore, all your current data and settings on your device will be replaced. This method is only viable if you’ve already made a backup, so if you haven’t done it already you cannot depend on this method. You can also consider restoring iCloud backup into your phone. Here’s how to do it. Step 1. Switch on the device and erase al the contents before starting the process. Step 2. Go to Apps & Data Screen > Restore from iCloud Backup. Step 3. Select the backup you intend to recover (consider the date and size to make it easy). Step 4. When prompted, you can sign into the Apple ID and restore your purchases (including apps). You’re only provided with 5GB of free storage which is a very small amount. You’ll need to pay for extra storage. Factors such as poor internet stability make it difficult to complete a backup, so you’ll need a reliable Wi-Fi connection. You cannot search and recover data selectively and before restore you need erase all your current data first. You can try all the methods we have mentioned above and decide which is the best option for you. If you don’t want to lose the existing data and need to restore data selectively, then iMyFone D-Back is highly recommended. We appreciate if you can leave us a comment mentioning the option you chose and how it goes.